Psalm 29:3–9 The voice of the LORD is upon the waters: The God of glory thundereth: The LORD is upon many waters. The voice of the LORD is powerful; The voice of the LORD is full of majesty. The voice of the LORD breaketh the cedars; Yea, the LORD breaketh the cedars of Lebanon. He maketh them also to skip like a calf; Lebanon and Sirion like a young unicorn. The voice of the LORD divideth the flames of fire. The voice of the LORD shaketh the wilderness; The LORD shaketh the wilderness of Kadesh. The voice of the LORD maketh the hinds to calve, And discovereth the forests: And in his temple doth every one speak of his glory. Most people know that The Creation account is recorded in the Book of Genesis. 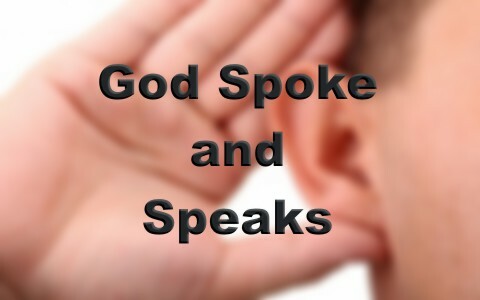 Here is a challenge: in that account in Chapters 1, 2 and 3, how many times does God speak? Exodus 20:1 And God spake all these words, saying. You can read Exodus 20:2-17 to see what commandments God spoke through Moses. Ezekiel 1:3 The word of the Lord came expressly unto Ezekiel the priest, the son of Buzi, in the land of the Chaldeans by the river Chebar; and the hand of the Lord was there upon him. Ezekiel 22:1-3 Moreover the word of the Lord came unto me, saying, Now, thou son of man, wilt thou judge, wilt thou judge the bloody city? yea, thou shalt shew her all her abominations. Then say thou, Thus saith the Lord God, The city sheddeth blood in the midst of it, that her time may come, and maketh idols against herself to defile herself. Ezekiel 30:1-3 he word of the Lord came again unto me, saying, Son of man, prophesy and say, Thus saith the Lord God; Howl ye, Woe worth the day! For the day is near, even the day of the Lord is near, a cloudy day; it shall be the time of the heathen. Ezekiel 33:1-4 Again the word of the Lord came unto me, saying, Son of man, speak to the children of thy people, and say unto them, When I bring the sword upon a land, if the people of the land take a man of their coasts, and set him for their watchman: If when he seeth the sword come upon the land, he blow the trumpet, and warn the people; Then whosoever heareth the sound of the trumpet, and taketh not warning; if the sword come, and take him away, his blood shall be upon his own head. Genesis 2:16–17 And the LORD God commanded the man, saying, Of every tree of the garden thou mayest freely eat: But of the tree of the knowledge of good and evil, thou shalt not eat of it: for in the day that thou eatest thereof thou shalt surely die. And in Genesis 3:13-24 God speaks to Adam and Eve to let them know the consequences of their disobedience to the one thing He told them not to do. The Book of Philemon is a wonderful letter from Paul to a fellow laborer on behalf of Onesimus (Philemon’s former slave that ran off). He appeals to Philemon that he would receive Onesimus back into his home, not as a servant but as a brother. Onesimus was kind to Paul when he was in prison and he made such an impression that Paul wrote this letter and asked Philemon to receive Onesimus as though he were receiving Paul. Acts 9:3–4 And as he [Saul/Paul] journeyed, he came near Damascus: and suddenly there shined round about him a light from heaven: And he fell to the earth, and heard a voice saying unto him, Saul, Saul, why ersecutes thou me? Acts 18:9–10 Then spake the Lord to Paul in the night by a vision, Be not afraid, but speak, and hold not thy peace: For I am with thee, and no man shall set on thee to hurt thee: for I have much people in this city. Acts 10:13–15 And there came a voice to him, Rise, Peter; kill, and eat. But Peter said, Not so, Lord; for I have never eaten any thing that is common or unclean. And the voice spake unto him again the second time, What God hath cleansed, that call not thou common. 2 Peter 1:16–18 For we have not followed cunningly devised fables, when we made known unto you the power and coming of our Lord Jesus Christ, but were eyewitnesses of his majesty. For he received from God the Father honour and glory, when there came such a voice to him from the excellent glory, This is my beloved Son, in whom I am well pleased. And this voice which came from heaven we heard, when we were with him in the holy mount. Luke 3:21–22 Now when all the people were baptized, it came to pass, that Jesus also being baptized, and praying, the heaven was opened, And the Holy Ghost descended in a bodily shape like a dove upon him, and a voice came from heaven, which said, Thou art my beloved Son; in thee I am well pleased. John 12:27–29 Now is my soul troubled; and what shall I say? Father, save me from this hour: but for this cause came I unto this hour. Father, glorify thy name. Then came there a voice from heaven, saying, I have both glorified it, and will glorify it again. The people therefore, that stood by, and heard it, said that it thundered: others said, An angel spake to him. God’s Words, even those He spoke as recorded in the Bible are just as important today as they have ever been. He speaks truth to us just as He did in Old Testament times in the words that have been preserved for us in the Bible. We can continually learn from these words when we are daily in the word and allow His Word to be a vital part of our everyday life. Something more for you to read: How Do We Know the Bible is True? Previous post: What Does “Come Short” Mean in Romans 3:23? Next post: How Can You Keep Satan Off Your Back?